If you hang around the home brewing blogs or browse through any home brew books, you’ll hear a lot of different terms thrown around. The ones that confused me the most when I started out was the terms for all the different types of home brewing. It got me feeling a little lost until I learned that there’s basically three different types of home brewing, well four if you count lagering, but that’s a much more advanced subject that I’ll talk about way down the road. Kit Brewing is the intro level to home brewing, think Mr. Beer. This is home brewing 101. It’s the easiest and quickest way, however you lose some of the control that comes with more advanced methods. It’s a good place to start if you want to try home brewing for the first time. 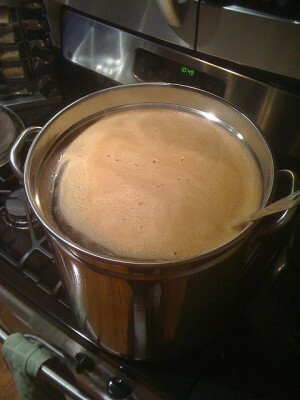 Kit Brewing is really just adding a can of malt extract (or hopped malt extract) and heating it up in your brew pot. After that’s done, you add some yeast and let it do it’s thing. It’s not complicated and you can brew up some very drinkable beers, however overall the results are probably going to be just okay. The next step up in the home brewing world is extract brewing. A lot of brewers skip the kit brewing and enter the brewing world here, however there is no correct answer when it comes to where to start. Extract brewing gives you a whole lot more control and options so that can better control the taste and smell of your brew. Extract Brewing is similar to Kit Brewing in that you add a malt extract, but you’re also throwing in steeped grains and hops into the mix. It’s a little bit more complicated, but there are lots of extract recipe kits out there and if you can follow directions, you can make a pretty good (or awesome) brew. The next level up is All Grain Brewing. It does require more equipment and the learning curve is a little bit higher, but there’s no other method that allows you such flexibility and creativity. All Grain Brewing is a lot like how the professional brewers make their beer. It takes out the extracts and you almost literally have to start from scratch.